Orlando and Kissimmee, but mostly Disney, ‘cuz I love it the best! in the world, Walt Disney World, is there. Why is it my favorite, you ask? Well, the first time we visited the area was way back in 1978 on our honeymoon. The Orlando / Kissimmee area was very different back then, not at all like the crazy busy area it is today. There were only a handful of motels on the Irlo Bronson Highway. There wasn’t a souvenir store on every corner. It didn’t take you forever to drive down route 192. And there was only one theme park in town, believe it or not, which was the Magic Kingdom at Walt Disney World. And the Magic Kingdom lived up to its name. It was totally magical, at least to me. I had spent my childhood going to theme parks like Ohio’s Cedar Point, Idora Park, and Geauga Lake Park, but I had never in my life experienced anything like the Magic Kingdom. This was back in the days that A to E tickets were still used to ride the rides, instead of all-inclusive passports, so you had to be selective on what you rode, or buy more tickets at the ticket booth. And it was in the days when the Magic Kingdom was still affordable to just about everyone. We could park, spend a day there, and eat for around $50 for both of us together. Most theme parks cater to those who love thrills, but the Magic Kingdom was for everyone and I could ride pretty much anything instead of sitting by the sidelines watching the people go by. I was hooked. We went for two days that trip. Magic Kingdom has changed a lot over the years, removing attractions and adding new ones and I love them all. I can never get enough of Pirates of the Caribbean, especially the new version with Jack Sparrow, or the Haunted Mansion. My bumper sticker says “My other car is a Doombuggy”. I can zip-id-e-doo-da along with the best of them. And the Hall of Presidents is a wonderful place for a quick nap to get you through the rest of your day. Just listening to the Disney music throughout the park brings back so many great childhood Disney movie memories. The Magic Kingdom will always be my favorite place in the world. In the years since that first trip, I’ve watched the skyline of Orlando and Kissimmee change, I’ve seen more and more motels and hotels crowd each other out, and I’ve seen many more theme parks come to the Orlando area. Disney has added three additional parks since those days. 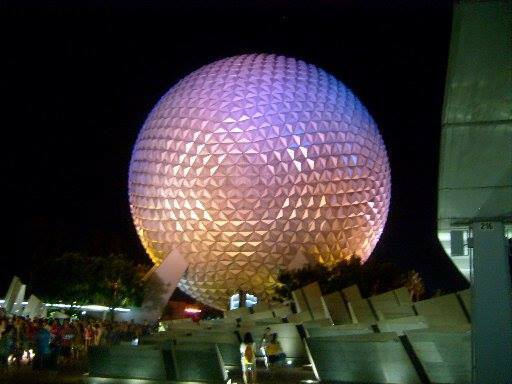 The first was Epcot. We didn’t visit Epcot until the year after it was opened. My brother came for a visit, we had moved to Florida by that time, had a daughter, and we decided to check Epcot out. And we were enthralled from the beginning. Life sized dinosaurs, a ride through a huge shiny ball, a boat ride through a futuristic farm. The kids loved Figment and Dreamfinder, I can still sing the song. And to top it off, you could visit other countries while you were still in Florida and learn about other cultures. Again, I could ride everything in the park. It was so nice to actually be able to participate in the fun for a change. The next Disney park on the scene was the Disney MGM Studios Park, now called Hollywood Studios. We had moved back to Ohio by that point to be near family, but still managed to vacation in the Orlando area most summers with our two daughters. MGM was a good park, but small at that time. However, we still enjoyed it, especially the Indiana Jones show, the Star Wars ride, the Great Movies ride, and the backlot tour. After that was the Animal Kingdom. We only visited there once and didn’t really enjoy it. It was hot and there was barely a place to cool down unless you wanted to get wet. The restaurants were even open air with not enough ventilation. After I experienced some nasty heat exhaustion there, we never went back. We probably never will. 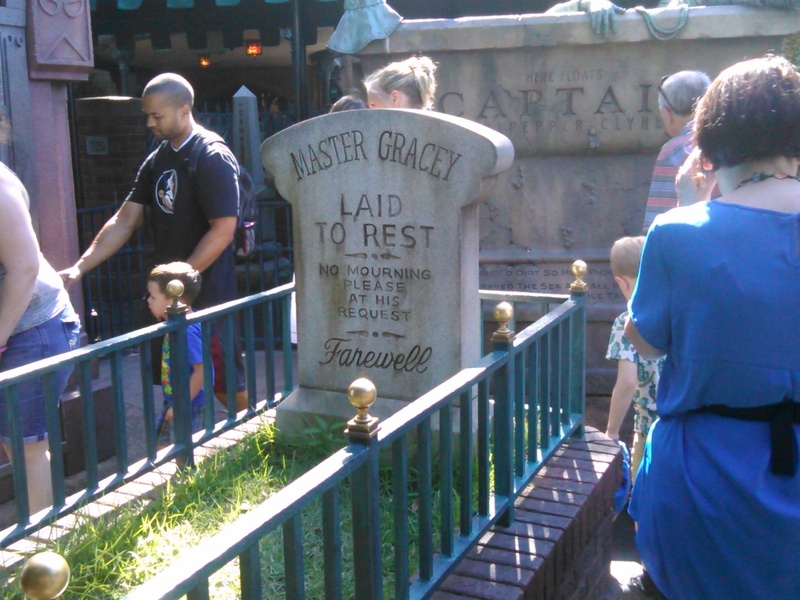 So, I guess that even Disney doesn’t always please everyone. Downtown Disney, now called Disney Springs, was a tiny place the first time we visited, hardly worth visiting at all. But now it has grown and grown into a sprawling complex with practically everything that you could ever want or need. They now have a new parking garage and adjacent parking lots with plenty of room to park. They have restaurants galore, more than enough shops, places to play, movie theaters, and a ginormous Disney Store. What more could you possibly want? It does get extremely crowded during peak season, so you need a double dose of patience to navigate through the tourists. But it too is a magical place. My last visit to the Magic Kingdom was on December 30th last year with one of my grown daughters. It had been on my bucket list for years to visit Magic Kingdom when it was decorated for the Holidays. It just so happened that a nephew was getting married in Florida on New Year’s Eve last year. What better chance to take the time to visit the Magic Kingdom decorated in all its Christmas Glory? My daughter was the only family member who was free to travel with me at that time, and she’s pretty much as Disney obsessed as I am, so off we went for a weekend of fun. 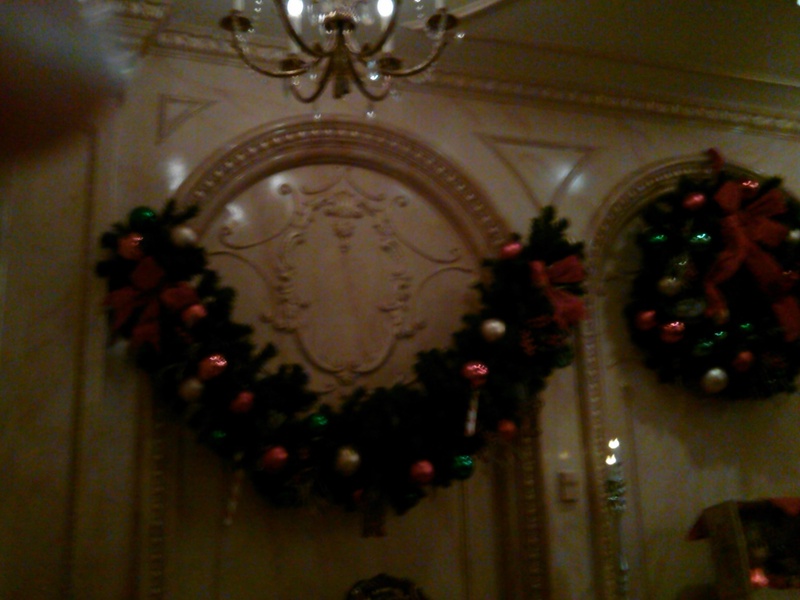 The Magic Kingdom was as beautifully decorated as I’d imagined, but to say that it was crowded is an understatement. It was okay in the morning, but as lunchtime neared, it was getting harder and harder to move around. Forget dashing to the next ride, it was more like wading through a mosh pit. And it was pretty cold for Florida that day. Thank goodness they had a Starbucks. I had tried to get lunch reservations at the Be Our Guest restaurant in the new section of Fantasyland months before, but had no luck. I really wanted to see the inside. But I was nothing but persistant, and a few days before we left I looked online again, and there was one lunchtime reservation available. Believe me, I snatched it up, and a good thing I did because lines for every restaurant were out the door and down the sidewalk. And it was a beautiful restaurant! The food was expensive though, and we weren’t as please with what we got, but we did get free Christmas gingerbread cookies. Disney at Christmas is magical, of course. The streets and windows are lit for Christmas, and some of the rides are decorated for the holidays. My favorite was the Jungle Cruise at night, with all of its Christmas lights. And Cinderella’s Castle was absolutely stunning when they lit it up after all the other lights went out. I had never seen so many people in the Magic Kingdom as between Christmas and New Year’s Eve, but in spite of all the people, we had a wonderful time at the Magic Kingdom that day, culminated by that magical light show on Cinderella’s Castle after dark. I am so glad that we went. However, prices are going up and up at the parks, so they are getting out of reach for a lot of people. It actually amazes me how many people will spend that much on a day at an amusement park (including me). That really tells you a lot about our world, where we need to escape and forget about our problems once in a while. I don’t know if I’ll be able to return though. Universal Studios was built around the same time as Disney MGM Studios. We’ve been to the original Universal Studios Park, and the newer Islands of Adventure Park a number of times, although Disney World really has my heart. We really aren’t into Harry Potter (gasp!) so we haven’t been back since the Harry Potter attractions took over some of the park. But we really did enjoy the parks years ago. My favorites have to be the ET ride, Men in Black, Spiderman, and The Mummy. King Kong, which was once where The Mummy is now, was a bit intense for my young daughter, but I loved it. I still think of it when I smell the scent of a banana. Gotta love the giant ape. And once again, I could ride almost everything in the two parks. Universal did a very good job in putting these parks together. And if you’re a Harry Potter fan, you’ll love it. It does look like fun, I would just have no idea on what’s going on. They also have a water park now which I have not visited. And City Walk, which is between the two parks, has excellent shopping and restaurants. Another attraction that I enjoy and always visit when I’m in the area is called Old Town. It’s on route 192 about one mile eastbound past I-4. Look for the Ferris Wheel on the right. We’d often stay at the Old Town Suites right next door when they were there and walk over there in the evening for some Flippers Pizza or some A&W or ice cream. The kids would ride some of the rides, and then we’d walk along the boardwalk and shop, and stop for a 10 cent Coca Cola at the General Store. On Saturday evenings they’d have an antique car show and cruise, it was fun to check out all the old automobiles. My favorite shop there, for some reason, has always been Black Market Minerals. I love the trinkets that you can find there. Always something unusual. It’s still there, they still have the antique car cruise, and I’m sure I’ll visit again. So, there are my favorite things in the Orlando / Kissimmee area, but there is a ton more to do. My advice to you is that if you want to check out the Orlando / Kissimmee area, be prepared for a lot of people and a lot of traffic. Don’t try to rush, and be sure and pack your patience. But, if you want a magical vacation, and if you love a good tourist trap, this is a great place to visit. This entry was posted in cruise port and tagged balcony, booking a cruise, Carnival, carnival cruise, cruise blog, cruise food, cruise port, cruiseblog, cruising, halloween, halloween cruise, quietcruiser, royalcaribbean, ship on October 24, 2017 by The Quiet Cruiser.